Congestion has been cut, buses are quicker and more reliable and the West End continues to do well since the introduction of the congestion charge two years ago. At the start of the scheme the Mayor of London, Ken Livingstone, called on commentators and detractors to give the scheme two years before deciding whether the scheme was a success or failure. The Mayor said: “Two years on and the congestion charge continues to be a success and prove the cynics wrong. Congestion in the zone is down by 30 per cent, bus services are improved and pollution has been cut. London’s West End is doing well, with figures from the Society of London Theatre showing that theatres took their best ever revenue in 2004 and achieved their second best audience numbers since records began in the 1980s. £170 million pounds will be raised by the end of the financial year to invest in London’s transport system (2003/4 - £80million, 2004/5 - projected net revenue of £90million). improvements to the 100 percent discount for registered holders of Blue Badges. to reduce a number of administrative charges. an information leaflet to be sent to 36 million households across the UK as part of DVLA correspondence. Seems like a natural for Manhattan, which has fewer than 20 automobile access points. LONDON -- The fabled Routemaster, the red double-decker bus that has graced London streets for half a century, makes its final journey today. Its distinct silhouette has been scrapped for a sleeker, bendy bus that can accommodate more people. for the Routemaster to go. It is just one of many changes in the way people get around Britain -- or try to, in some of Europe's worst traffic. Livingstone also created and then enlarged the ''congestion zone" and raised the daily charge to £8 ($13.89) per day for private cars traveling through central London. He also has created incentives for people to ride buses and the subway, and is talking about a car-free 2012 Olympics. Outside of London, congestion on small country roads is prompting other unusual ideas. Officials last week announced a £7 billion pilot scheme to test the feasibility of ''road pricing" in selected areas of the United Kingdom. Road pricing would use advanced technology to track cars on the roads and charge them based on mileage, time of day, and congestion of the area in which they are driving. But if Steven Roberts is any indication, it is going to be a tough sell to get Britons out of their cars and onto the public transportation system, even with the most innovative measures. Roberts, an investment banker, does not like to use the Tube, London's subway system, which he describes as, among other things, ''jam-packed, stinky, smelly, super hot, and just unreliable." So every morning, Roberts's commute to work is a bit like a video game. He leaves his house in southwest London by 6:30 a.m., and his mission is to drive all the way across to east London's Canary Wharf by no later than 7 a.m., when the congestion charge takes effect. If he is late, takes a wrong turn, or gets stuck in traffic, he gets charged. And he does not leave the office until 6:30, when the congestion charge ends. In London, Europe's biggest city, the transportation problem is becoming a crisis. Its population is expected to grow by a whopping 800,000 by 2016 to more than 8 million, increasing the demands on transport by 28 percent. Aided by former Boston T guru Robert Kiley, who has served as the head of London's transport network since 2001 and will step down in January, Livingstone has been pushing people to use public transportation. He says the congestion charge, introduced in February 2003, has cut traffic, reduced commute times, and provided much-needed funds to divert back to public transportation. In July 2004, he raised the price from £5 to £8, and in September he proposed extending the zone to encompass more of London's neighborhoods. Livingstone has gotten more people on buses by offering free bus passes to people under 16, putting more buses on the roads, and by establishing special bus lanes within the city. Still, the Tube, London's underground system, is plagued by delays, and train drivers are threatening to strike over working conditions. It is not unusual to go to a Tube station and find that your destination is not accessible because of engineering work or a breakdown. Policymakers blame the crisis on chronic underfunding of public transport. Britain has invested 30 percent less per capita on transportation than other European countries in the last 25 years, according to the Confederation of British Industry, an employers' organization. The organization also found that more than half of UK businesses think that the country's reputation as a place to do business has been harmed by transport problems, and the majority expect it to worsen. ''The British want European-style public services but with American-style taxes, and so Britain ends up with a highly stretched public transport system," said Tony Travers, director of the Greater London Group at the London School of Economics and Political Science. Fares have also been raised repeatedly to generate more money to invest back in the system. The average British family spent about £60 ($105) on transport per week in 2004-2005, more than they spent on food, recreation, housing, and health, according to the Office of National Statistics. London has one of the most expensive public transportation systems in Europe. ''What we've then got in London is people being priced out of cars and priced out of public transport," Travers said. ''What I'm not so sure about myself is the impact on the long-term desirability of London as a place to live." Outside of London, small roads, unreliable trains, and an increase in cars have also fueled congestion. There are 25 million cars on the roads of Britain, and the government has predicted that the time spent in traffic could increase by 20 percent in the next few years. ''As people get richer, there's more traffic and more people on the roads. We simply can't provide enough road capacity to deal with it, and so congestion's going to get worse," said Stephen Glaister, professor of transport and infrastructure at Imperial College London. Congestion on the roads appears to be driving some to public transportation. Rail passenger demand grew by 44 percent in the West Midlands over the past decade as people looked for alternative ways to get to work. This overloaded the rail system to such an extent that the trains are simply not long enough to accommodate all of the passengers, said Heather Crocker, transport adviser to the development agency for the region. To offset this increase, rail companies announced a pricing system that rewards people for traveling in off-peak times, and budget fares on some trains to London. Even this might not be enough. In Birmingham, the train station is often so full that authorities have to close it for fear of dangerous overcrowding. Talk of a congestion charge, coupled with the increasing rail problems, prompted the local paper's editorial page to sum up what many in Britain are feeling: ''No trains, no cars, how do we get to work?" Never make hyperbolic statements while in public office. haha - are there any pols who don't? I know thw Routemasters have retired to tourist routes, but they haven't just been replaced by bendy-buses, have they? There are still plenty of red double-decker lines that aren't Routemasters, right? Bus ridership in London (already at 6mn each day: as many as those that take London Commuter Rail and the London Underground combined) is soaring at around 40% (2001-2011). London Commuter Rail is seeing a renaissance as rolling stock being rapidly updated (the average commuter train is now around 14.29 years old in London and the surrounding metro and falling) and the year on year increase usage of London commuter trains is around 54mn. Currently 121km (75.1miles) of heavy rail is being built in and around London (CTRL, East London Line, Piccadilly, Heathrow Express + DLR) which would add to the whopping 5,081km (excluding trams) of heavy rail route km already in London. More lines, routes and extensions are approved or proposed meaning this figure will only continue to increase. On another note, London is also re-building its once vast tram network (once one of the largest in the world), which is expected to encircle the entire city eventually. So I'd say its pretty good. Obviously with London where the streets are far more confined, it made more sense because the road capacity in Central London compared to Lower and Mid-Manhattan is far greater. That said, New York should employ it, just like most cities should where public transport exists. 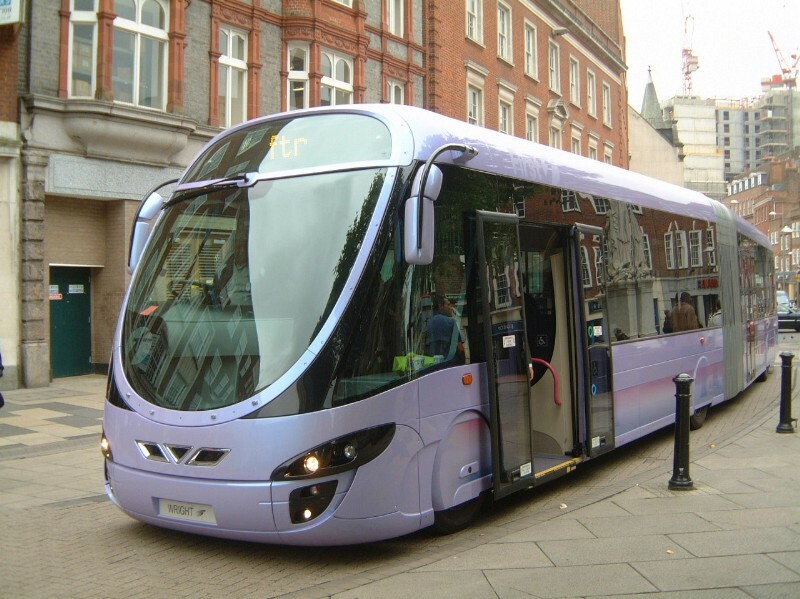 This bus, the new Alexander Dennis Enviro 400 were first released to the world in January 2006. London ordered 56, the first replaced the exact bus lost in the 7th July bombings (which was itself a doubled decker). Other double deckers are also continually being built for London from a variety of different bus manufacturers. 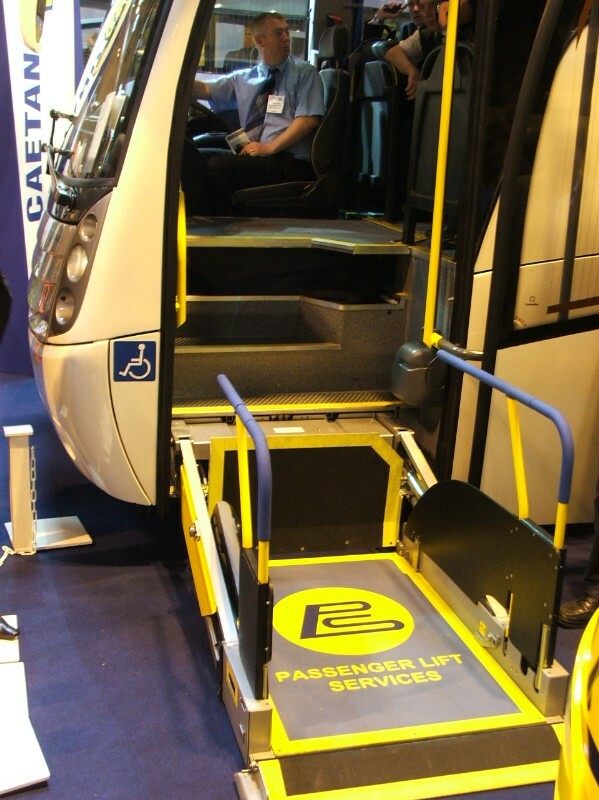 Ramps actually descend from the base of these double deckers meaning wheelchair bound passengers can use double deckers. So while times move on, the red double decker will remain an icon in London and will do so for the forseeable future. 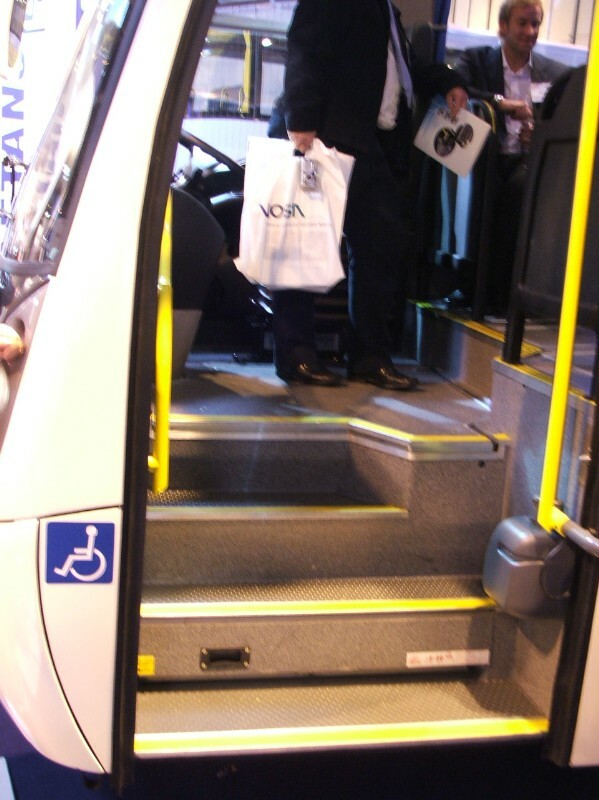 One of the coolest new modes of transport, are the new Network Express coaches in operation in and around London....just look at the snazzy little lift: just opens out from one of the steps! Its things like this, that people are returing to public transport in their droves. 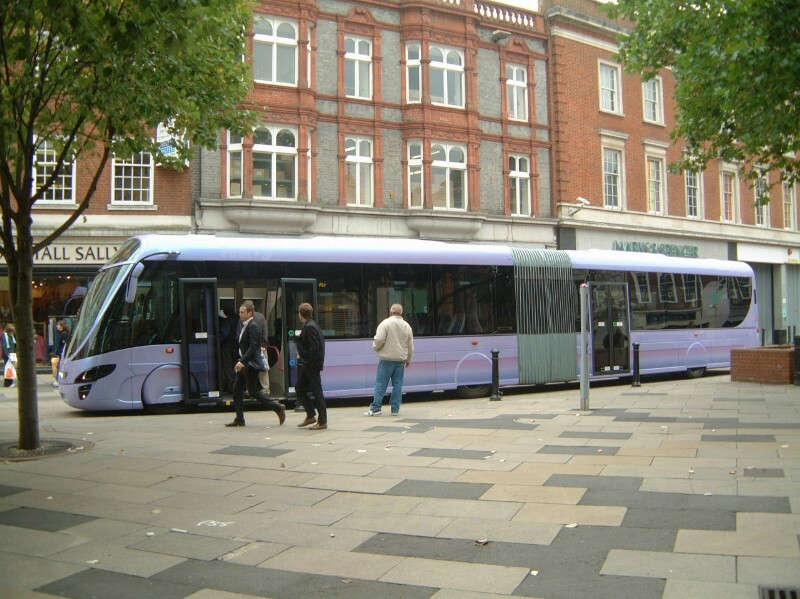 Another innovation being developed are 'streetcars': they look like trams, operate a bit like trams but are bendy buses. This model being tested is in the London commuter town of Reading (due west of London Heathrow Airport). the UK Government will eventually extend road charging to the entire road network. They will do this by the mandatory fixing of transceivers to vehicles from which satelites can track the movement of the vehicle; when it went, the time it went, the speed it went and charges will apply accordingly. PS - those Routemaster buses can be bought for $8,000 - Bargain! Last edited by Marksix; March 2nd, 2006 at 04:59 AM. If we do this, the units used should be local tranceivers not GPS units. That way, while you are in the city, you do have your speed tracked and all that crap, but once you are out on the highway, Big Brother is not watching you. I just would feel more uncomfortable with a device that would be able to see where you go at all times in that you would always be tracable and every move you make, if it one day disagreed with whoever was in charge, could be your last. They are able to take the DNA of every person they arrest regardless of whether they charge them and it is at their discretion if they destroy those samples. So far, no police force has destroyed any sample and currently hold DNA samples of children as young a eight years old. It will be natural to add this biometric data to the ID cards or even simply link that database with other government databases linked to ID cards. You may think "British suckers" for allowing this (it wasn't in any party's manifesto) but don't feel too smug; one reason given by our government was that it's being done to satisfy the requirements of the US government and many of the companies bidding for the contracts are US corporations. Of course if you have nothing to hide you have nothing to fear. Do you. Last edited by Marksix; March 2nd, 2006 at 03:59 PM. Yup, that's what they say. But it doesn't take high tech. In Cuba they do it with a Madame Defarge in every block. They call this the Committee of Defense. Nothing to hide = nothing to fear. It still is not precise unless you turn on the GPS on the unit. Two things would worry me about that. 1. They actually make a law making it mandatory to have the GPS on at all times. 2. They already have something on there that says that they can turn it on themselves remotely if they "need" to. I know what you are saying though, and the whole thing creeps me out. GPS systems are already common on some car models (ie if it gets stolen, the tracker is turned on and it can be traced). Even my laptop has one: think I went OTT with that one. That said a GPS based system does have problems, but has benefits: the UK is moving towards a pay as you go society and its unfair that some users of the roads pay equal amounts as those that may use it far more often. This way you offer a modern flexible cost for using UK roads. What better way to charge people, than to charge people on how busy the road is and what time of day it is. The scope means that you have greater control over the money which could be increased to allow for greater investment into public transport. This is all moving towards Minority Report type vehicles: ie you don't drive as its all controlled by a computer and the speed is controlled to ensure no accidents take place and to allow for higher capacity usage of busy roads. Sound crazy, but this is gradually becoming more and more a reality. What we need to do is provide as much input into the lengthy discussions that will take place so that possible concerns can be noted. Regarding ID Cards, currently if you are stopped, you could be either taken into custody for questioning or asked to go to your local police station within a certain number of days. These cards would essentially negate this requirement to go to a police station as essentially the card is bringing together current databases into a single database, rather than many which opens the chances of greater corruption and inacurracies. What I'm against is the cost and I personally believe the card should go further, ie an all encompassing passport/drivers licence, etc which again means fewer databases delays for the person in question. On the continent, ID cards have been used and Britain used to have them only until 'recently'. In the ideal world, we wouldn't need these things because nobody would do no wrong, but generally I believe the card is about the amalgamation of databases and creating a system that is less open to corrupt influences due to less access to these multiple databases. Add on to this all of the surveillence cameras going up around the various cities (London, New York +): if they want to soon they'll know whenever you blow your nose.